Robot cars, DIY or otherwise, are hot right now. To do this right, you’re going to need cameras, LIDAR, or some other way of sensing the the world. Intel is again getting into the fray with a RealSense tracking camera for simultaneous localization and mapping for robotics, drone, and augmented reality needs. The tech specs for the Intel RealSense T265 are impressive for small robotics uses. It includes 6DoF tracking gathered by two cameras, each with a 170° FoV. Connection to a computer is through USB 2.0 or 3.0. If you want to get an idea of how seriously Intel is taking the ‘robotics, and other power- and weight-limited platforms’ market, here’s a sample of what is on the one-page spec sheet: the T265 only uses 1.5 Watts, weighs 55 grams, and is 108 x 25 x 13 mm. There are also two M3 taps spaced 50mm apart on the back, which is an astonishing spec to publish on the product landing page. Simply the fact that the location and dimensions of the mounting holes is so prominent gives you an idea of how seriously Intel is taking robotics and prototyping applications. This new SLAM camera complements Intel’s other tracking camera offerings, including those we’ve seen at Maker Faires past. It’s a competitor to the new crop of solid state LIDAR modules we’ve seen pop up recently. It’s not a Kinect, but we’re years past using a first-gen Kinect for robotics applications. Now, everything is custom chips and SLAM processing, and the RealSense T265 is the smallest platform to do that now. Despite being over 25 years old, the original DOOM is still a favorite among gamers and hackers alike. For years now, running the 1993 demonic shooter has been a critical milestone when hacking or reverse engineering a piece of gear, and at this point we’ve seen it run on everything from voting machines to cameras. But this time around, DOOM isn’t actually running on the device being hacked. Instead, the Roomba 980 that [Rich Whitehouse] has doing his bidding is being used to generate new DOOM levels based on the maps it makes of rooms while going about its business. To be fair they’re pretty simplistic maps, and most of us don’t live in a home quite palatial enough to even fill out shareware trial of id Software’s classic, but it’s still a neat trick. For those who might not be up to date with the latest and greatest in the world of robotic helpers, newer model Roomba vacuums are equipped with a camera and the ability to generate 3D maps of its environment using a technique called Vision Simultaneous Localization and Mapping (VSLAM). Ostensibly this capability is used to create accurate maps of hazards in the cleaning area, but of course it did set off some privacy alarm bells when introduced due to the possibility that scans of users homes could end up being used for nefarious purposes. Roomba manufacturer iRobot swears they aren’t doing anything suspect with the data their robots collect while traveling through the user’s home, but that hasn’t stopped [Rich] from using the technology as a portal to Hell. Using “DOOMBA”, the user is able to download the mapping data off of their Roomba 980 (it might work on other models, but hasn’t been tested yet) over the local network and import it into Noesis, a 3D model viewing program developed by [Rich]. 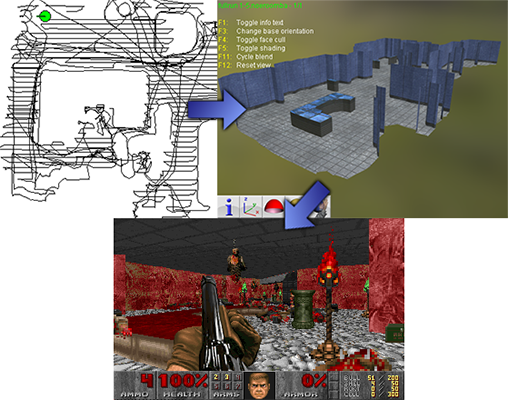 The imported map is essentially just a 2D diagram of the home’s floor plan, which on its own wouldn’t make for a terribly interesting DOOM level, so the software will take the liberty of seeding it with weapons, baddies, and all the other varied delights of the netherworld. The user can fiddle around with these settings to try and fine-tune their homespun hellscape, or just let “DOOMBA” randomize it all so they can get on with the ripping and tearing. If you’ve got Roomba in hand but aren’t a DOOM fan, have no fear. We’ve seen plenty of hacks and mods for everyone’s favorite house-cleaning hockey puck which happen to be of the non-demonic variety. If you just can’t get enough DOOM, stick around for tomorrow’s 25th anniversary celebration article. You will want to copy the banner art and use it as your new desktop background. Peter started following KiCad and FreeCAD Hack Chat. wfree4 liked Big 7 segment display. J Kirk started following KiCad and FreeCAD Hack Chat. Jonas liked pcbtc (GaN edition). rkisensee has followed a list. Jose Guia liked ESP cookbook. Amador lopez liked Flypi - cheap microscope/experimental setup. c.Invent wrote a reply on FunKey project - All your games on your keychain !. Paul Berkley liked FunKey project - All your games on your keychain !. Jimmie Rodgers liked pcbtc (GaN edition).